Halloween is my favorite holiday (I wish it could last all year) because my birthday is in October and because Halloween has all of the interesting characters. When EBSQ announced the Zombie Chicken contest, I knew I had to create a few pieces for it. This is the second ACEO card I drew for the contest. 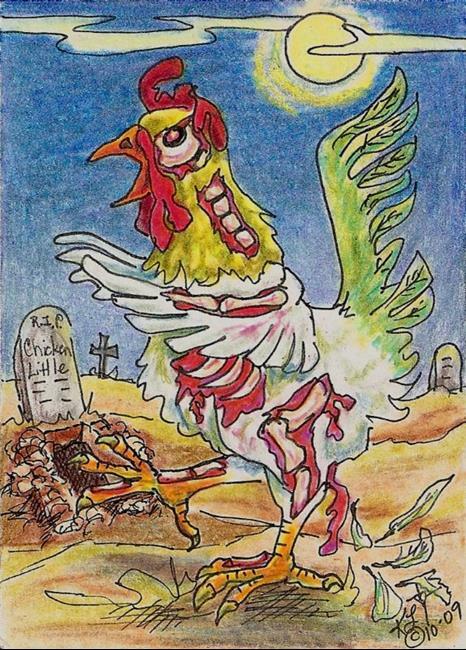 We raise chickens and 'Zombie Chicken Little' was drawn from a photo of George, an Americana rooster we had a few years ago. He is also styled after the skeleton horses I create. 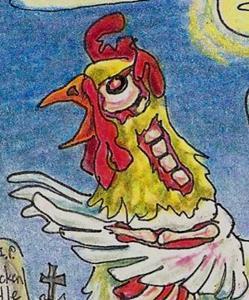 This Zombie Chicken has evolved more than the first one. His opened grave (my daughter Victoria's idea) can be seen in the background. He has more exposed flesh and bones than the previous chicken. He's evil appearance guarantees lots of mayhem on All Hallows Eve. 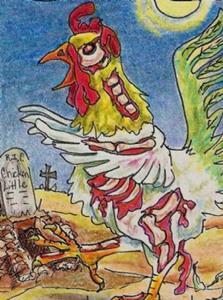 'Zombie Chicken Little' was drawn on 110 lb. smooth art paper using Prismacolor® pencils and black ink pen.